The flowers are dark rose to reddish purple, the segments taper tipped and longer than the stamens. The flowers are borne in a simple umbel at the top of the stem. Dark-colored outer coat on the bulb. Height 20cm. Also known as Allium hollandicum it produces a few untidy leaves in early spring and these have almost died away when the flower stem elongates and produces the ball of light purple flowers in May/June. If you leave the heads on, it produces green seed capsules which last for several weeks after the flowers have faded. Height 75cm. From central Asia. Small creamy-white ball-shaped flowers. Height 75cm, flowering July/August. From dry rocky habitats in central Asia. A vigorous large plant, with huge dense umbels of lilac-purple flowers with deep purple filaments, reaching up to 100 mm across. It can grow more than 1.5m tall. This is a very dramatic plant, particularly if grown in rich, deep soils. Tall growing variety approx 1200 mm. Violet mauve flowers and the bulbs are edible. ‘Mouse Garlic’ is a semi-evergreen variety which forms clumps of 30cm long narrow leaves, topped in summer with drumsticks of light- to mid-pink flowers. Height 45cm. Sometimes called allium pyrenaicum by mistake. A deep red-purple allium with star-shaped flowers in a tight flat umbel 10cm wide appearing in May-June. Height 60cm. From the Himalaya. A ball-shaped head with dark purple-violet tepals and longer filaments.Grows to 90cm and flowers June/July. Native to Crimea and Caucasus considered a bit of a weed, liking dry clay soils. An oustanding sterile hybrid raised in 1959 by Jan R Bijl from A. cristophii and A. macleanii. Huge round heads (up to 20cm in diameter) of light violet-purple flowers on sturdy stems in June. Flowers are similar to its pollen parent, leaves are glossy, bright green. Height 90cm. A beautiful Chinese species that's difficult to come by true-to-name, most often replaced by other species such as A. cyaneum. The stamens are hidden and the flowers are funnel-shaped with open mouths. One of the most attractive of the smaller alliums. Flowering in late summer, this clump forming bulb produces stiff stems carrying drooping umbels of up to 10 pure white bell-shaped flowers. A native of Western China, this is a superb plant for a rockery or front of border. height 15-25cm. Also known as Allium azureum. Small dense spherical umbels 40mm wide of bright blue flowers appear in June. Very easy to grow and increases well. The grass-like leaves wither before the flowers appear. Suitable for a rock or scree garden grown in small clumps. From the steppes of Asia. Height 60cm. While the heads are globular like caeruleum, the pedicels are strongly upright. The florets are less open and starry than caeruleum, and are more narrowly campanulate in shape and the stamens are hidden. Flower color is variable from white to azure with dark blue midribs. A North American native with flowers pale rose-pink to reddish in May-June. Height 15cm. A semi-evergreen allium, flowering mid to late summer. Violet-pink flowers, held in small, loose, slightly elongated umbels. Forms a good clump quickly and can be divided in autumn. Not invasive. Height 45cm. The tree onion is a genuinely perennial form of A. cepa that is sometimes grown in the herb garden for its edible bulbils used as a mild salad onion. It suits either the border, a herb garden or a place in a decorative vegetable garden. It has hollow leaves. 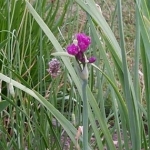 Small purple drumstick flowers are produced in June. Height 30-45cm (12-18"). A pretty species with lilac-rose, bell shaped flowers, held in loose, nodding clusters which become upright as the seeds ripen. Very variable in height and foliage. Height 45cm. From North America. A particular robust selection raised by John Wall at Wisley's Alpine Department in 1948. It has violet flowers appearing in June/July, height 75cm. Also known as Allium albopilosum. One of the most popular, all round alliums. Large, metallic lilac, star shaped flowers are held in large, loose umbels, up to 200 mm across. Wide strap-shaped shiny green leaves. The seed heads dry well and are ideal for flower arranging. It can self-sow a little. Height 45cm. From central Asia. A popular Chinese allium that blooms from midsummer. This is a variable species, from tiny dwarfs only a few inches tall, to taller, upright plants. The open, starry blooms have telltale long stamens. A lovely late summer flowering species with loose clusters of tubular, very dark reddish-purple flowers. The mouths of each flower are highly divided. Excellent garden species. Height 30cm (10"). 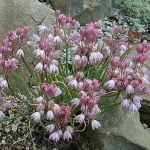 A dwarf species that does well in a sunny rockery, this bulb from the United States produces a dense umbel, about 5cm (2") in diameter, of bell-shaped rose-pink to purple-pink flowers. The foliage is grey-green and sickle-shaped. Height 10cm (4"). A hybrid between A. atropurpureum and A. christophii, it combines the beauty of both parents to give very impressive, huge deep purple umbels in June/July. Ornamental seedheads. Reaches about 75cm. A good clump-forming species that produces unusual greenish yellow flowerheads up to 8cm across. Height 60cm. A well-known yellow-flowered allium producing its loose umbels of bell-shaped flowers in July/August. Grown from seed and self-sows freely. Broad silver-green tulip-like leaves. Height 45cm. A later flowering species producing large plumes of bell shaped, bright yellow flowers. Excellent for the rockery, flowers are produced through June and July. Height 45cm. (12-20"). A dwarf form of the species, growing to only 10-15cm. A huge tall spike some 1.2m tall bearing a very dense umbel of bright mauve-purple flowers, often there are hundreds of flowers per umbel. Flowers late June and through July. From Himalaya. A Dutch nursery sterile hybrid between A. x.hollandicum and A. macleanii. A dramatic plant in any border, rose-purple flowers carried on strong 1.2m tall stems. Bulbs increase only slowly. An absolutely stunning plant with star-shaped, violet-purple flowers borne in dense umbels. This is one of the sturdiest alliums. Height 90cm. A sterile hybrid of A. cristophii and A. macleanii raised by Jan R Bijl. A hybrid raised from A. giganteum and A. christophii, this produces beautiful large violet drumsticks up to 15cm across in June. Height 60cm. A dwarf species that is extremely rare in its native America, this cultivated form produces looses clusters of strong pink flowers in June. Height 15cm. From Iran, Iraq and Turkey, this allium which is scarce in production produces large drumsticks of white star-shaped flowers up to 10cm (4") across at the start of June. One of the taller species, so great for adding height to the border. Height 120cm (4ft). A seedling from A. macleanii. The flowers are bluish-purple and can be 13cm across. Foliage is glossy and persists until well after flowering. Lilac-blue flowers carried on strong 90cm stems. A good reliable variety (possible a hybrid as it doesn't come true from seed) but scarce in cultivation. It was introduced in 1948 by the Dutch firm, van Tubergen as allium aflatunense but this is actually from Central Asia and is taller with twisted, reflexed sepals. Probably one of the best known of the drumstick alliums. Rich, deep purple ball-shaped flowers 75 mm diameter appear in June/July. Associates very well with silver under-planting. Attractive seedheads. Height 90cm. Selected by Jan R Bijl in 1964. Flowers red-purple. Height 20cm. Native to stony slopes in the Italian alps (the limestone-rich Regio insubrica). Huge violet umbels, 15 cm in diameter, bloom on 60-80 cm stems in May-July. The florets have a white style. The wide leaves stay green during flowering. These are large bulbs that multiply slowly. Native to Afghanistan. A very useful dwarf allium, its large glaucous foliage makes for excellent, well behaved groundcover. Silvery-white flower spikes grow up some 20cm diameter. Height 30cm. From Kara Tau mountains in Kazakhstan. A superior form of the above with bright yellow-white flowers. Makes ideal ground cover or looks good in tubs. A Dutch nursery sterile hybrid between A. x.hollandicum and A. macleanii. An attractive plant with unusually good foliage. Large violet purple flowers carried on 100cm stems. Good cut flower. Bulbs increase only slowly. Beautiful compact umbels of pinkish-purple, with white stamens giving the appearance of having a halo around it. Height 90cm. Found in India and Western China, this dwarf species produces lovely loose umbels of up to 20 bell-shaped deep purple-pink flowers in summer. Height 20-30cm. A very unusual late-flowering species which carries loose heads of bright pink bell-shaped flowers with red spots. Height 15-25cm. Dainty rose-pink flowers bloom for weeks in July-August amid grassy foliage. Forms a neat clump. Native to NW Yunnan Province in China. Introduced from there by George Forrest, who found it in high alpine meadows. Height 10-15 cm. A selection from A. stipitatum. A vigorous variety with dark purple flowers, and foliage that persists well after flowering. Any well drained soil. Height 120cm. Bright white flowers in spring fit nicely with the very ornamental fine silver gray foliage which looks good all year Tight clumps with flowers reach 20cm. A reliable dwarf yellow species, excellent for the rock garden, or for underplanting roses. Flowers in early to midsummer. Height 30cm. Increases well. Prone to slug attack. From south-west France. Far superior to the species, this wonderful selection flowers about 14 days before the species. Creamy white drumstick, a little later to flower than A. ‘Mount Everest’. Very reliable, and easy to grow. Increases quite well. Height 75cm. An excellent white hybrid between A. x.hollandicum and A. stipitatum. Growing to about 100cm (40") tall it is one of the best white alliums. A delightful alpine with chive-like leaves and rose-purple flowers on strong stems. Likes lime so a limestone rock garden is ideal. Also called ‘White Garlic’. A good rock garden allium but not widely available. Flowers are pure white, scented and carried in quite sparse umbels in late spring. From Mediterranean so not fully hardy in UK. Height 30cm. Very similar to the species but definitely a larger flower and a little earlier. 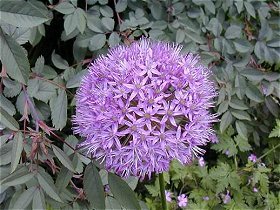 Introduced by James Cowan, a London bulb merchant in 1823 and thought to be the first allium from South America. It is now known that there are none in South America. Height 30cm. As the name suggests, a larger-flowered variety of the species. Again needs good drainage and a sheltered position. Of the same group as A.karataviense. this species has much longer leaves. Height 30cm. Also called A. multibulbosum. Flowers are pale lilac or white, with a greenish stripe down the top of the petals appearing in early summer. Height about 60cm. Easy to grow from seed or bulbils. A delightful species that carries a dense, flattish umbel of mid pink flowers. Flowers in June and July and is happy in most conditions. Height 25cm. This species is different to the other yellow flowered on in that the flowers are held in a tight round ball. The flowers are bright yellow, occasionally tinged with green. Height 80cm. Fine dwarf species for the rock garden. Growing to about 12cm, the bright rose-purple flowers in loose umbels are long-lasting. Flowers in early summer. From Caucasus. Fine selection of the species, with brighter rose-purple flowers. Height 30cm. One of the earliest to flower. White umbels produced as early as April. Height 35cm. The flowers, small round heads of white, are borne from mid and late summer, and the petals can be used as a garnish on salads. The grass-like foliage can be cut and used as a herb with a slightly lighter and fresher taste than common chives. Height 30cm. A beautiful border allium, producing in summer 1m high drumsticks of star-shaped deep purple flowers with protruding violet stamens. The tallest selection of A. rosenbachianum standing about 1.2m tall and also has the largest umbels of bright violet flowers 10cm wide. The new foliage is attractive in that the leaves all have red tips when they first emerge. Increases well and is quite happy in any soil. The latest of the A. rosenbachianum forms to flower. Blooms are a very deep rich purple and are carried in dense umbels about 70cm tall. Another easy variety for the rockery (meaning it self-sows furiously), growing some 25cm tall, it provides a splash of pink flowers throughout June and July. Huge drumstick heads of lilac-mauve flowers appear in mid-June on the top of very robust stems. A stunning hybrid when in full flower. Height 90-120cm. Huge, deep purple umbels, 8-10 cm across, bloom in June on 50-70cm stems. The pleated leaves are up to 40cm long and 7cm wide. Native to Central Asia but rare in cultivation. An annual allium. White flowers. Grown near roses it repels aphids. Height 30cm. This dwarf rock garden species, growing to only 20cm is variable in colour, producing small pincushion-like flowerheads from mid-pink through to pure white. Scarce in cultivation. A selected form of the common herb ‘Chives’. Offers good decorative appeal and doubles for kitchen use. Closely related to common chives, this is a very decorative species producing umbels of up to 30 pure white flowers. Superb addition to any potager or ornamental vegetable garden. Height 30-60cm. A fantastic selected strain of A. schoenoprasum, this is more vigourous than the species and produces lovely heads of bright deep purplish pink flowers. Height 60cm. One of the most dramatic alliums of all, beloved by flower arrangers. Rose-red spidery flowers in June/July. Height 45cm. One of the darkest flowering species, through June and July this produces loose 30mm ball-shaped umbels of dark magenta flowers at the top of wiry stems. Height 60cm. One of the darkest flowering species, this produces through June and July loose umbels of dark magenta flowers at the top of wiry stems. Height 60-90cm. Pinkish-purple flowers in small umbels. Grows to about 25cm. Very useful for establishing in hot dry places where nothing much else will grow. A clump-forming species that produces several narrow leaves per bulb, so the foliage provides quite a luxuriant backdrop to the pretty pale to deep pink flowers held in tight umbels in summer. Height 15-30cm. A beautiful Chinese species that can be difficult to acquire true to name. It is frequently confused with beesianum and cyaneum. Allium sikkimense is typically smaller and lower growing than beesianum, the pedicels are very short (yielding a tighter cluster-head look), and the flowers are narrow bells, almost bottle-shaped and barely opening. Height 15cm. Flowers in July. From Himalaya. Deep purple-crimson flowers carried on 60cm stems in mid to late summer. Dark green leaves. Looks superb growing through Artemisia 'Powys Castle' or other silver foliage. From Europe. Solid purple centred flower with strange spiralled green petals poking out. Forms a dense umbel approx 4cm across. Unlike any of the traditional Alliums, and an absolute must for any garden. A tall stately allium some 120cm high. Its dense umbels carrying hundreds of lilac-purple flowers. It is also particularly good as a dried flower. The most popular white drumstick allium, standing over 120cm tall it adds height to any border or shrubbery. It also increases quite well. An impressive hybrid onion with deep green glossy foliage that makes its own statement even without the pink flowers that stand 60cm tall. Blooms July/August. A valuable late-flowering allium for autumn colour. Height 25cm, flowering in October. From Japanese Islands. A good rock-garden selection. Height 25cm, flowering in October. Clusters of white flowers, each with a green stripe on the reverse. Thrives well in shade. Grows to 30cm. Flowers in spring. Naturalises well (that is self-sows vigorously). From southern Europe. Clump forming variety. Aromatic foliage. Flowers are white, appearing in midsummer. Height 30cm. Californian species growing about 30cm high, with bright lilac-pink flowers in loose umbels amidst the leaves. A good front of border plant. Perhaps the prettiest of the American species. Needs sun and good drainage. ‘Wild Garlic’. A vigorous plant for naturalising in woodland. Producing large swathes of white flowers about 25cm tall in May. A beautiful species from the Alps, this has very attractive large glaucous mid-green leaves, from which emerge slender stems topped with round white flower heads 4-5cm in diameter.One of the more subtle Alliums. Height 30-45cm. Pink or purple tepals with a darker vein. Flowers July/August. From southern Europe. Likes alkaline soil. An excellent hybrid with methyl violet drumsticks carried handsomely above strong 70cm stems. An excellent cut flower, and a increases well. A lovely late-flowering variety from Nepal, producing masses of star-shaped purple flowers held in loose umbels. Provides a welcome splash of colour in the autumn border. Height 60cm. As the name suggests, this is a giant of an Allium. The flower heads are large and dense, pure white in colour. Height 180cm. Thrives in hot dry conditions where not much else will grow.